It was more than an inspiration to find this next recipe waiting for me in my inbox. This time delivered from Food.com. There it stared at me, the Oreo Ball. I had never heard of it before, but it intrigued me. Pulverized Oreos, only three ingredients and no baking required. So simple, it seemed too good to be true. Looking for a fun treat to make with my boys for the holidays and knowing each adored Oreos, I decided to give it a try. I am pleased to say the Oreo Ball did not let me down. What eye-catching beauties they were when plated with a single stem of crimson flowers on a white backdrop. So rich, so sweet, and so divine. If you adore chocolate in the extreme as I do, it’s a must try recipe. Two of my boys go crazy over them. So I’ve renamed them Oreo Bon Bons. This name change represents the two goods (en francais) and the doubly toothy smiles these treats elicited from my boys numbered two and three. Funny, but boy number one was not crazy about them. He is more of a pizelle-man, enjoying a more subtle sweetness like butter. But, then again he prefers vanilla ice-cream. But that is ok. Two of my boys are in Love. Furthermore, one boy expressed his individual tastes. A win, win in my eyes. One friend suggested using Trader Joe’s Peppermint JoJo’s for variety. While my aunt suggested including the extract of vanilla into the creamy centers. I have a feeling that these variations would also be wonderful and might better suit boy number one’s personal palette. I also think they’d make a an inviting presentation as a Bon Bon Pop. They are all the rage now. Perhaps a to do for next year’s list. But for now, if you are in the mood for a sweet and overindulgent experience, give these Milk and White Chocolate-dipped Oreo Bon Bons a go. For superior results be sure to use high-quality dipping chocolate, Ghirardelli or the like. Otherwise, chocolate-flavored almond bark will suffice. *Or if you prefer, substitute a high-quality dipping chocolate like the kind used for dipping strawberries. Using a hand held mixer, mix crushed Oreos and cream cheese together. Roll into walnut size balls. Place on waxed paper lined platter and chill for one hour. Melt approximately 3/4 package of white almond bark. Follow Microwave melting direction on Bark’s packaging. 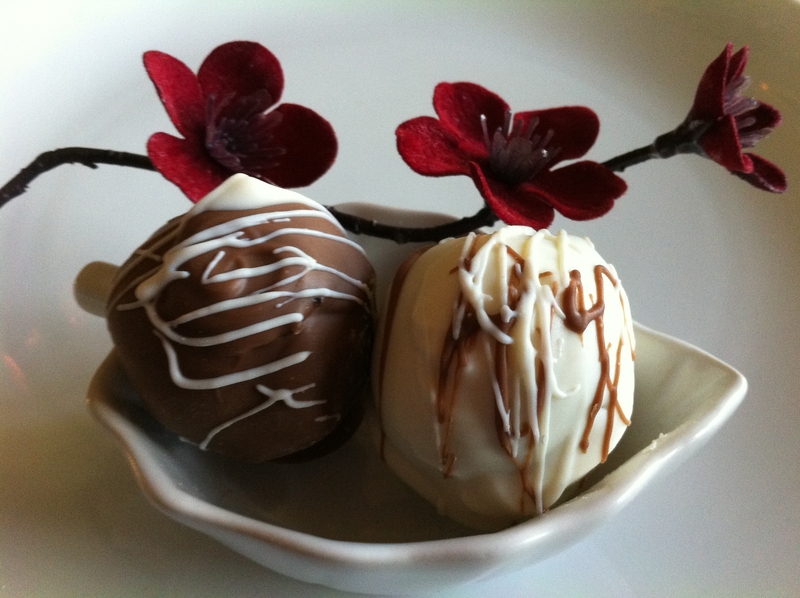 Stick a toothpick in an Oreo ball and dip it in the melted white almond bark in microwave. Allow to harden on wax paper.This will takes about 15 minutes. While waiting, melt about 1/4 package of chocolate almond bark. When Oreo balls are no longer sticky to the touch, decorate with drizzles of chocolate almond bark. I used a spoon and waved it back and forth over the hardened chocolate shell to get the desired decorative look. Repeat using the opposite combination. Dip in chocolate and drizzle with white chocolate.